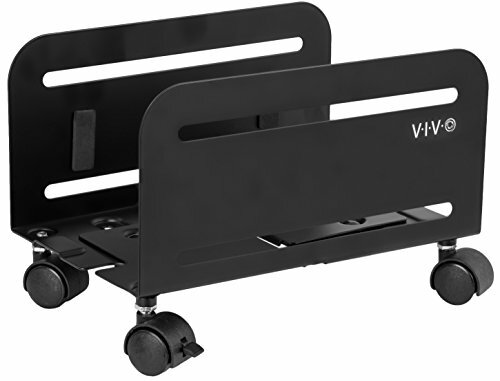 Mobile adjustable PC stand (CART-PC01) from VIVO. 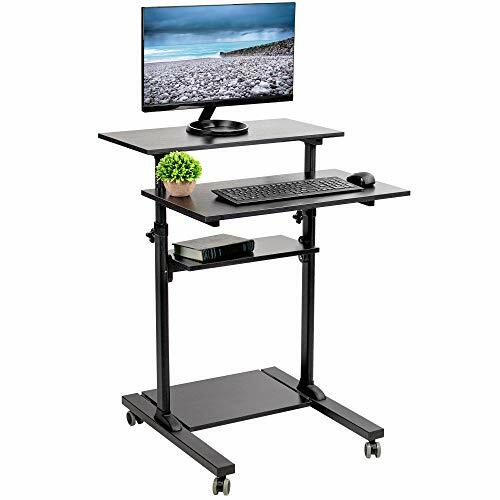 Increase the ease of mobility of your computer with this solidly constructed PC cart which features four caster wheels for easy access, two are lockable to keep the cart stationary when desired. Along with its high grade steel material, the frame has a powder coated finish and features inside padding to protect your PC from scratches. The cart comes in a matte black finish, maintaining a low profile and blending in well with a majority of environments. ADJUSTMENT- Cart is adjustable from 4.7 to 8.2 allowing it to accommodate most ATX cases on the market. NOTE: Please check your PC case dimensions before purchasing to ensure that the width does not exceed 8.2. SONGMICS under desk printer cart is a nice way to make a much-needed printer disappear within a cramped office space. It is specially designed for efficiency and gives an organized look to your office or home. 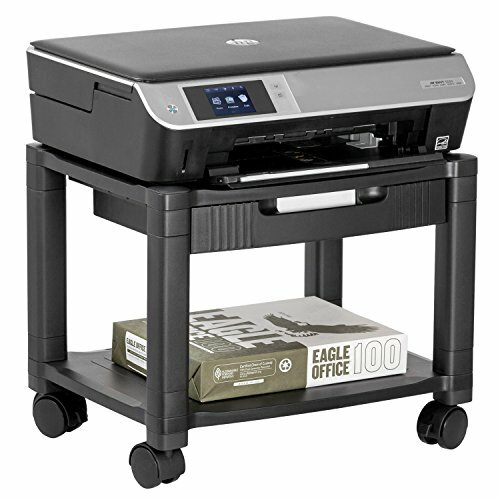 Features a good sized top to hold a full size printer and a sturdy board shelf to hold office supplies. 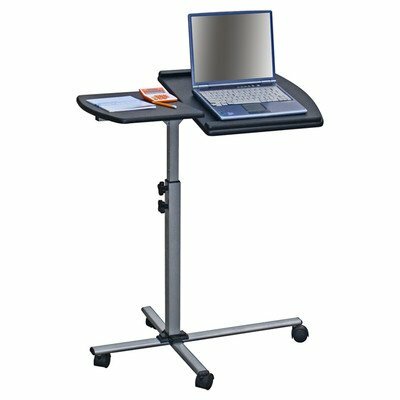 The stand on casters can be rolled out for scanning or copying, also easily slides under the desk for storage when not in use. The two locking casters ensure it doesn't move when you don't want it to. The top is laminated to prevent abrasions, powder coated metal tubes are corrosion resistant and black finish looks attractive and classic. 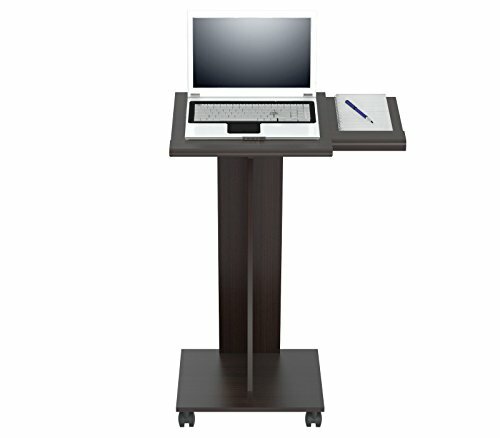 SONGMICS Under Desk Machine Stand is the perfect answer to your small office machine needs. Adjustable width from 5 to 9"
Mobile CPU Stand features a slim sleek design. Adjustable width accommodates a large range of CPUs. Supports up to 60 lbs. 4 locking caster wheels for stability. Black. Brand: Kantek | Manufacturer: Kantek Inc. Enhance your work area with spacious height adjustable mobile stand-up desk (CART-V02DB) from VIVO! This is the perfect mobile computer/laptop station for use at the office, home, showroom, and classroom, and provides ample room for typing, writing, and storing. The frame is made with sturdy steel materials and features built-in height adjustment with 11 different locking intervals. The height can be adjusted low enough to work from an ergonomic sitting position, or be quickly raised to a comfortable standing position (minimum height: 37", maximum height: 54.5"). The bottom wheels have two locking casters to make your cart stationary or mobile when desired. Maneuverability is excellent with total side width of 28" and a front width of 27.5". This cart comes with 4 shelves made of MDF materials covered with a dark brown wood laminate that blends well in any environment. The maximum total recommended weight is 132 lbs (not recommended to exceed 33 lbs per shelf). All the necessary hardware and instructions are provided, so you can get your new cart assembled and improving work comfort in no time! Desktop Dimensions: 27.5" x 14"
Keyboard Tray Dimensions: 27.5" x 15.7"
Middle Storage Shelf Dimensions: 18.6" x 9.2"
Bottom Storage Shelf Dimensions: 18" x 13.7"
Base Dimensions: 23.7" x 25.8"
HEIGHT ADJUSTABLE - Ergonomic height adjustable workstation takes you from sitting to standing position with 11 different locking intervals for ideal customization (Min Height: 37", Max Height: 54.5"). SPACE EFFICIENT - Four sturdy platforms (Top monitor shelf, slightly lower keyboard shelf, middle shelf, and a base shelf for pc tower, printer, speakers, etc..) makes this compact mobile desk ideal for smaller workspaces in offices, apartments, classrooms, and more! 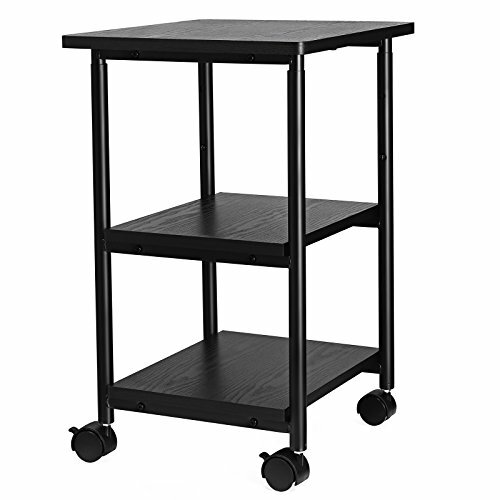 SOLID CONSTRUCTION - The sturdy steel frame and solid MDF shelves are made for scratch resistance, durability, and excellent support to keep your equipment safe and secure. Maximum total recommended weight is 132 lbs (not recommended to exceed 33 lbs per shelf). 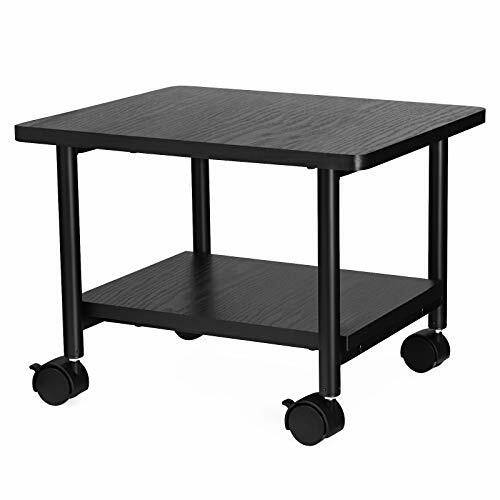 SMOOTH MOBILITY - Four durable casters create easy mobility, and two casters are lockable to make the desk stationary when desired. The total width of the cart is 27.5 and the total side length is 28. WE'VE GOT YOU COVERED - This cart comes with a limited 1-year Manufacturer Warranty, as well as friendly tech support to help with any questions or concerns. Mount-It! CPU floor stand saves space on your desktop by allowing you to move your PC computer tower under the desk or beside it. 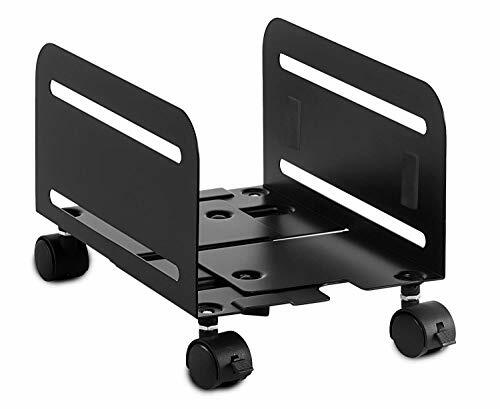 Adjustable mobile CPU stand conforms to most ATX cases. The stand features simple adjustment and easy transportation. It has a range of width adjustment for most ATX towers from min 6 inches to max 10.25 inches. With 4 castor wheels the ATX case can be easily transportable and allows easy access to back of the computer. 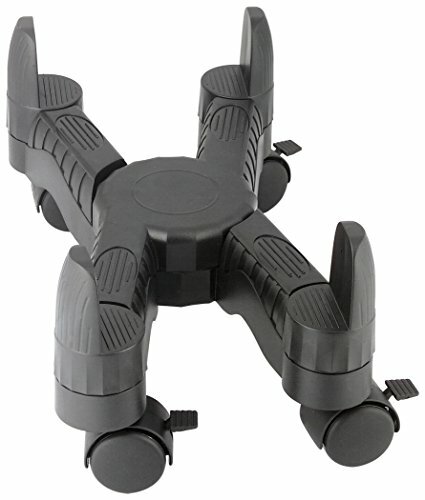 4 lockable wheels prevent the stand from sliding. 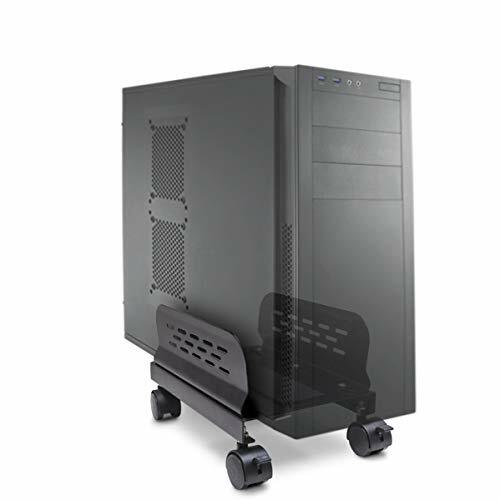 The casters also provide additional height to keep your computer clean and facilitate increased airflow. 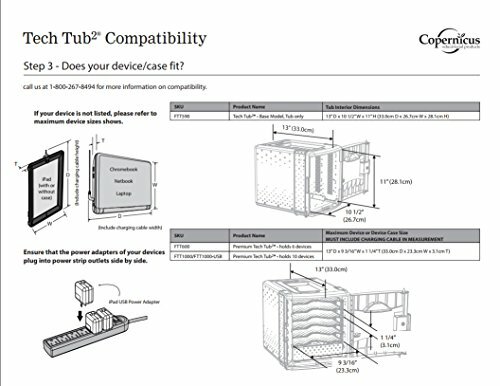 The universal design expands to fit computer towers up to 10.25 inches in width. Tools are not required to adjust the width. Simply loosen the wingnuts to adjust the width. Made from durable hardened plastic with 60 lbs carrying capacity. The elevated sides keep your computer in place and provide additional stability. The added pads at touch points further protect your computer from scratches and increases the hold of the case. Buy today for more space, protection of your computer and added convenience at the office. PC TOWER FLOOR STAND - CPU stands designed to support and elevate most desktop / tower style computers for easier access. Increases airflow and saves desktop space by storing the CPU under or beside your desk. ADJUSTABLE WIDTH FITS MOST COMPUTER CASES - Computer caddy adjusts from 6 - 10.25 Inches of width to hold most CPUs. No tools needed. PROTECTS YOUR COMPUTER - Felts pads on clamps provide a firm grip on your CPU and protects it from scratching and scuffing. HEAVY-DUTY DESIGN - Durable construction with 60 lbs capacity. This PC stand will outlast your computers for years to come. Tech Tub2 offers an affordable, flexible and mobile solution for charging and storing devices used in PreK-8 classrooms. Our Premium Tech Tubs hold 6 iPads, Chromebooks or a combination of both. Store, charge and carry your devices anywhere in the school with ease. Functional modern design is an excellent choice for home. Laminated in double-faced durable melamine which is stain, heat and scratch resistant. Finished in Espresso-Wengue. Solid engineered wood P2 standard, coming from well managed forests. Four (4) wheels for easy mobility. Wheels comes with lock to secure in place. Can be assembled to be used with mouse on left or right surface. Two (2) separate work surfaces. Assembly Required. Solid engineered wood P2 standard, coming from well managed forests. Four (4) wheels for easy mobility. Wheels comes with lock to secure in place. Can be assembled to be used with mouse on left or right surface. 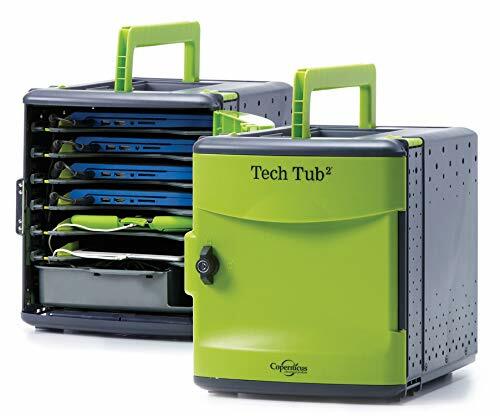 Tech Tub stores 6 iPads, Chromebooks or tablets. Store, charge and carry your devices anywhere in the school with ease. 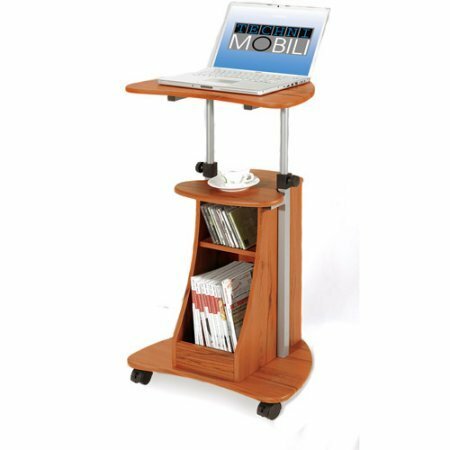 The Techni Mobili Deluxe Rolling Laptop Stand is made of heavy-duty engineered wood panels with a moisture resistant PVC laminate veneer and a scratch-resistant powder-coated steel frame. The main table panel tilts so you can adjust it to the most ergonomic, comfortable working angle. It also features a safety edge-stopper to prevent objects from sliding off when the panel is tilted. You can also easily adjust the height between 30 and 35 Inch with a knob system. The extended 4th leg provides increased stability. Two of the fours non-marking nylon casters include locking mechanisms. 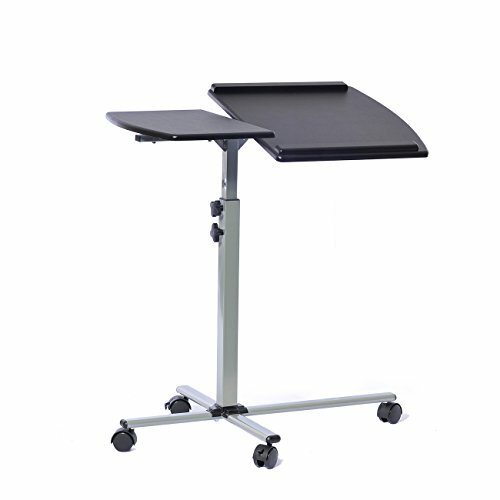 The main tilting table panel has a 30 lb weight capacity and the stationary table panel has a 45 lb weight capacity. 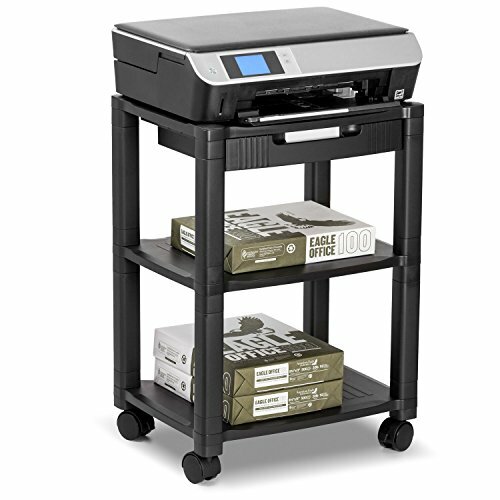 Look no further than the Halter Mini Printer Cart! Dimensions: 17.13" X 13.19" X 14.02"
Extend the life of your valuable equipment! 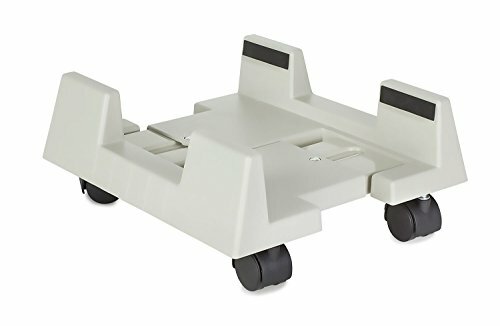 By using this rolling CPU stand, you are protecting your computer against dust and grime that can get into the unit if it sits on the floor. It also adds convenience since it can be rolled around easily on the floor if you need to access it for any reason. MOBILE CPU HOLDER - This computer tower holder is designed to support and elevate most computers for easier access. Increases airflow and saves desktop space by storing the CPU under or beside your desk. 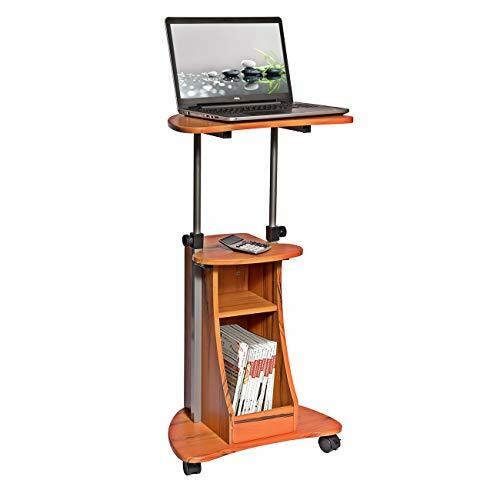 LOCKING WHEELS - Two locking wheels and swiveling casters on this computer tower stand provide mobility and stability. Rolls for easier access to back of the computer. UNIVERSAL DESIGN - CPU holder width adjusts from 4.87 - 8.5 inches to hold most CPUs. The dimensions of this stand are 10.25 x 5 inches not including the wheels. PROTECTS YOUR COMPUTER - By placing your computer in this computer tower cart you are helping extend the life by protecting it against dust and debris. This stand also features padding to protect from scratching. HEAVY-DUTY DESIGN - Durable construction with 22 lbs capacity. This mobile CPU stand will outlast your equipment for years to come. This mobile laptop station is perfect for use at the office, home, showroom, classroom, etc., and provides ample room for typing, writing, and storing. This rolling stand-up desk is designed with two spacious platforms. The upper one, with a maximum load capacity of 20 kg, is ideal for placing laptops, books, lecture notes, etc., its integrated lip helps to securely hold your items in place. It also tilts down 40 degrees for ease of use. The lower shelf keeps small accessories such as glasses, cups or pens within reach. The height can be adjusted low enough to make you work in an ergonomic sitting position, or be quickly raised to a comfortable standing posture. 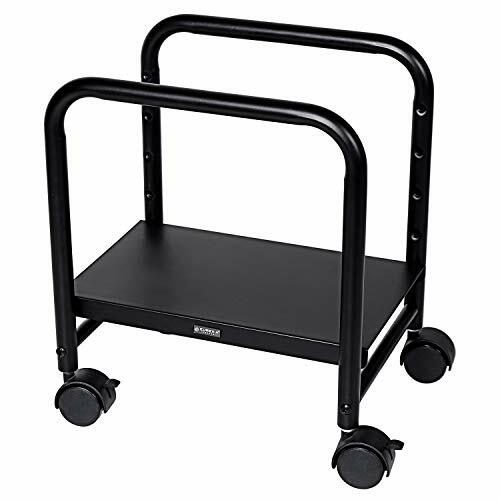 Equipped with four heavy-duty casters, this computer cart is able to move around easily; the built-in locking mechanism allows it to be stationary or mobile when desired. Made of high-quality steel with powder coating, this mobile laptop workstation is sturdy and durable. The low-profile rear feet design adds to its stability. All necessary hardware and installation instructions are provided for assembly.